On the final night of a convention filled with mishaps -- of the plagiarism, non-endorsement varieties -- Donald Trump painted a bleak picture of America, even as he officially accepted the Republican party's nomination for the presidency. His name was stamped in bold font across the convention hall jumbotron as he walked on stage. "I humbly and gratefully accept your nomination for the presidency of the United States," Trump began his speech. He paused for a moment before departing from his prepared remarks to join the audience in chanting: "USA! USA! USA!" At this point, Trump couldn't help but gloat a little over his victory in the primary race. "Who would have believed that when we started this journey on June 16th of last year we - and I say 'we' because we are a team - would have received almost 14 million votes, the most in the history of the Republican Party," he said, "and that the Republican Party would get 60 percent more votes than it received four years ago." He noted that the Democratic party's primary voter turnout rates were "not so good." The billionaire proceeded to lay out a dark vision of America: "Our convention occurs at a moment of crisis for our nation. The attacks on our police, and the terrorism in our cities, threaten our very way of life." "Americans watching this address tonight have seen the recent images of violence in our streets and the chaos in our communities," he continued. "Many have witnessed this violence personally. Some have even been its victims." But he positioned himself as the country's singular savior. "I have a message for all of you," he said. "The crime and violence that today afflicts our nation will soon -- and I mean very soon -- come to an end. Beginning on January 20th 2017, safety will be restored." Trump took a moment to knock the Democrats' convention next week, telling the convention hall, "if you want to hear the corporate spin, the carefully-crafted lies, and the media myths -- the Democrats are holding their convention next week." "But here, at our convention, there will be no lies," he added. "We will honor the American people with the truth, and nothing else." The truth, as Trump saw is, included: a spike in violent crime rates in the U.S., a 50 percent rise in police officers killed in the line of duty since last year, and a plunge in average household income. In short: America is in dire straits. America and its allies overseas, according to Trump, weren't faring much better. France, he noted "is the victim of brutal Islamic terrorism. Men, women and children viciously mowed down. Lives ruined. Families ripped apart. A nation in mourning," he said. "The damage and devastation that can be inflicted by Islamic radicals has been proven over and over - at the World Trade Center, at an office party in San Bernardino, at the Boston Marathon, at a military recruiting center in Chattanooga, and many more." On foreign policy, the business mogul rejected the globalization that has been embraced by both parties, promising instead a protectionist "America first," and ensuring that the U.S. isn't disrespected abroad. In an interview with the New York Times, Trump said that he would rethink honoring the NATO military alliance. "Americanism, not globalism, will be our credo," Trump said Thursday. "As long as we are led by politicians who will not put America First, then we can be assured that other nations will not treat America with respect. This will all change when I take office." And what ails America he suggested could be remedied by changing the party in power. "The problems we face now - poverty and violence at home, war and destruction abroad - will last only as long as we continue relying on the same politicians who created them in the first place," Trump said. "A change in leadership is required to produce a change in outcomes." As far as Trump is concerned, that means keeping Hillary Clinton out of the White House. "My opponent asks her supporters to recite a three-word loyalty pledge. It reads: 'I'm With Her,'" he said. "I choose to recite a different pledge. My pledge reads: 'I'm with you' -- the American people." Trump added emphatically: "I am your voice." You are not our voice, @realDonaldTrump. He hit some classic GOP crowd-pleasers as well, including replacing and repealing Obamacare and building a wall to solve illegal immigration. 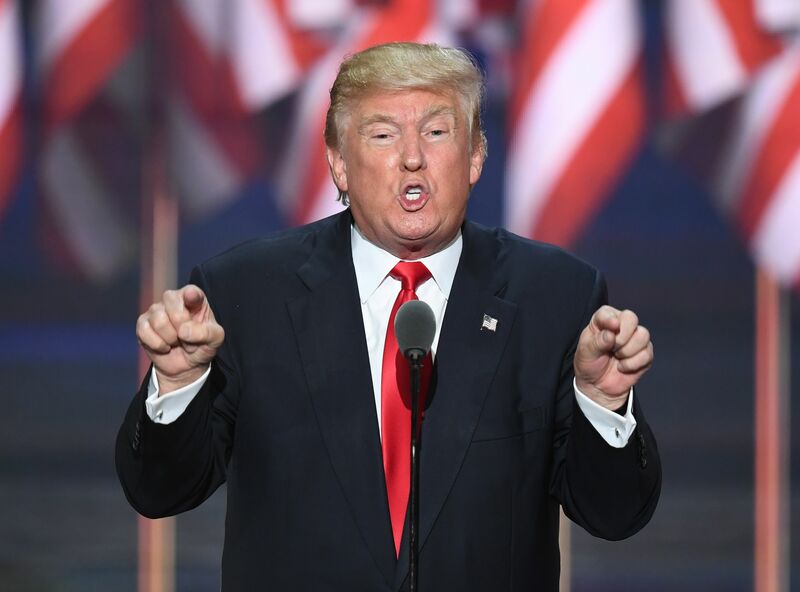 But though his speech promised to deliver solid economic and foreign policy agendas, Trump failed to outline any specific proposals on either front in the hour and fifteen minutes he was on stage. He brought up a broad energy proposal that he first brought up in May that would "lift the restrictions on the production of American energy," that he promised would create "more than 20 trillion dollars in job-creating economic activity" and "millions" of jobs, though there was no detail given on how these numbers would be reached. There were same lofty promises he's peddled since the beginning of his campaign. "We will make America strong again," Trump said at his speech's conclusion. "We will make America proud again. We will make America safe again." "And," naturally, "we will make America great again." CBS News' Julia Boccagno contributed to this report.